The online publication Mostly Truthful will be launched at Lancaster's Storey Institute tomorrow as part of the 2009 Lancaster Literature Festival. Here's the elegantly stylish cover. The publication will be available on line shortly from the Litfest website. In a blog post from yesterday (before, it has to be said, her reading at the Manchester Blog Awards, where she seemed quite chipper), Jenn Ashworth wrote eloquently about a particular kind of "sad." It must be a writer's thing because I know exactly what she means. It's a little bit of longing, a little bit of nostalgia, and under it all, perhaps, a sense of anxiety, like you've slipped away from what makes you tick. I put it down to some disjunction of the planets or my biorhythms all dipping together, or my other self having taken a vacation leave this husk behind to deal with the reality of life. Jenn's analogy of it being like walking into a house on the different side of the street, and feel like you're going the wrong way, everything backwards, is spot on. What it means, really, is that I need to take some time out. I need to pull away, create some space, create some perspective, because that's what you need. I was at Brussels airport on Tuesday and could see the Belgium airways plane through the glass of the departure gate. When I got to where I thought it was, the plane had seemed to move, an optical illusion - it was a few gates further down. I found myself unable to compute this distinction. I was tired and in the bubble that you get when you're travelling a long way for a long meeting. Coming back to Manchester, and going out the next night to the blog awards, that disjunction remained. I seemed to be getting every little nuance wrong. The venue, familiar old Band on the Wall, was also the same, but different, the first time I'd been since it reopened. I remembered seeing an Elbow showcase gig here, before "Asleep in the Back" had come out, I remembered swaying next to a swaying Andrew O'Hagan talking about writing after him and Dave Haslam had took me there after a reading at Waterstones. I'm imagining writing a story about a character who is so at the extent of their senses that its a constant adrenaline rush, but the story would have to be called "burn out." We are all fire, but only with sufficient kindling. Tonight at the Selfridges Moet bar, another episode of the week's soap opera. Meeting friends in public places drinking other people's wine and eating other people's canapes. Tomorrow I step down from the heady air of the last few days and try and regain a sense of equilibrium. As you get older you are more likely to get "vertigo", not from tall buildings, but from your environment, becoming dizzy at the thought. As a kid you spin around and around until everything direction is down, collapsing in a delirious spiral. I've had enough delirium for a while. Saturday I have to stand up and, in the lovely surroundings of Lancaster's literary festival, be one of four writers reading from the new Flax publication, "Mostly Truthful." At tonight's Manchester blog awards I had provided input to the judges, and so waited to see if I was vindicated, like a dodgy bloke in a betting shop. I got a couple right and a couple of runners-up, as problem gamblers always probably do. It was much fun, as always in the somewhat unchanged (from memory) interior of Band on the Wall. Last time I was here was an Elbow showcase gig before they'd released their first album. Go figure. Fitting in a few thoughts about writing. It's not the lack of "doing" time that frustrates me at the moment but the lack of thinking and reflecting time. Sometimes you can get so much more "done" when you are busy, but it's like taking money out of your savings, the reserves get depleted after a while. So I seem to be being incredibly productive, in many different ways, but I know that the emotional, psychological and creative-artistic savings accounts are all running dangerously low. I get the occasional top up by going to an exhibition or reading a book or watching a TV series, but not had much time to think about even those things. More productively I've been going back through the last five years or so of my writing. I've always been fitting this into a busy life, and that's been fine. Yet the five years before that, basically 1997-2002, my productivity was off the chart. I finished five very different novels, wrote a wide range of poems and short stories, fitted in a screenplay; let alone at least three unfinished novels that I really should go back to one day. But quantity isn't as important as quality - and what's been good is going back and reading work that I might be dismissive of because of how long ago it was, and finding that it's actually well written and carefully edited. The time went into it. I don't mind playing the long game. The person I was then has a different perspective and sensibility to the one I am now, but the difference is more circumstances and age, than anything fundamental. Writers, musicians, we're the lucky ones in many ways. Most people can only look at old photographs and recall what they were like on the outside, we get to read our old thoughts, and recall what we felt like on the inside. The Manchester Literature Festival will have to survive a little bit without me this year (I'm sure it will manage) as I've got a busy week or so. I hope to get to the Whitworth tomorrow for a dose of Salt writers - its a great venue for catching literature, and nice not to have to go all the way into town. Then I'll be making time to get to the Blog Awards on Wednesday at Band on the Wall - first time I'll have made it to the re-opened venue. 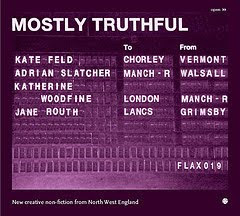 Part of my reason for not being around is that I'm in Lancaster next Saturday for the launch of the latest publication from Flax books, Mostly Truthful, which I'm one of 4 non-fiction contributors to. Read a little bit more about it here. I went to University in Lancaster (finishing with an English degree) so it feels a kind of homecoming. I've continued to enjoy the contributions to Everyday Genius this month as well. It's been an important week in poetry, with the announcement of the Forward Prize winners (Don Paterson, Emma Jones and Robin Robertson) to coincide with National Poetry Day. The latter seems to limp along a little these days, though the BBC dutifully covers it (this year: Dreadlock Alien, Daisy Goodwin and Alison Steadman were the talking heads on breakfast) and I'm sure there's a lot of decent education work goes on. I've always liked Paterson's poetry, and its a surprise he's not won the Forward before - though he won "best poem" last year. The last six Forward Prizes for best collection, and 9 out of the last 10, have been won by Faber and Picador, which hardly seems to represent the state of poetry publishing in Britain at the moment. Of all the poetry prizes, faced with a diverse shortlist, the Forward does seem to veer towards the bigger names. An observation, that's all. Yet, if National Poetry Day seems less lustrous than it did when it started (partly, I think, because of its obsession with gimmicks and "accessibility" ahead of creating a genuine culture of poetic exploration), its not the only place where poetry seems to be continuing its long fade into darkness. You have to go back to 1996 to find a poet on the list, though this year's winner Herta Muller writes poetry and prose. American poet John Ashbery or Australian poet Les Murray would seem to be massive names that the Nobel has so far overlooked. On the other hand, grass roots poetry writing, publishing and events continues in abundance. It was reassuring that when the Poetry Society asked who our favourite poet was, T.S. Eliot won. I watched the recent Arena documentary, and fascinating as it was, it always takes you back to the poetry. He remains our "brand poetry" - whether its the T.S. Eliot prize, or with the continued respect, that Faber's list receives. I'm wondering if they still read him in schools? He's allusive rather than difficult of course, and, perhaps uniquely, a writer of long poems that are still read, ahead of shorter lyrics. At the Other Room this week, Michael Haslam introduced one of his poems talking about the great "wrecks" of modernism such as Finnegan's Wake or the Cantos. I think it's a great way of talking about them - these colossal vessels that set sail, and finally ran aground. Eliot, a cautious sailor one imagines, pretty much avoided writing those great "wrecks", though his later verse dramas may be his equivalent, and it is interesting: the first truly modern poet, (with "The Love Song of J. Alfred Prufrock"), saw that he had arrived at the point of the modern, and did not need to race ahead in a futile race to be ever more so. On BBC Breakfast a spurious connection was made between T.S. Eliot's "newness" and that of performance poetry, a brand that hasn't had a new idea for thirty years or more. Eliot, himself a Nobel winner, is an impossible example for contemporary poetry - the world is so different - but at the same time, his seriousness, his commitment, and his promotion of both the best of the past, and through his work at Faber, the talent of the present is a touchstone. In the documentary, he says that the one thing that you can say about contemporary poetry, is that it is written by your contemporaries. My very short story "The Girlfriend Who Got Me Into Mazzy Star" is now online as today's choice at Everyday Genius, which this month is being edited by Lee Rourke, author of "Everyday." I was pleased to be asked to contribute, and I've enjoyed the variety so far. I've done something a little bit different, as this short story comes with a Google Map, so you can see where it takes place! More map-based stories can be found at the excellent Rainy City Stories. Offline, I'm about to read the first two handsome publications from Nick Royle's "Nightjar" press. You can also check out the video podcast of Craig Dworkin which was shown on Wednesday at The Other Room. His hip hop Beowulf's particularly good. Other things have been going on, in digital, art and politics, so haven't had much to write about writing. This will be short, but to point out a few goings on. The ever-excellent night "The Other Room" returns on Wednesday at the Old Abbey Inn. It also showcases the launch of the bumper "final issue" of if P then q . Related to the same event, is the launch of the occasional editions from the intriguely named zimZalla. One of the more interesting literary blogs is Everyday Genius, which has a monthly guest editor inviting their writing cohort to supply daily doses of "everyday genius." This month its "Everyday" author, and Scarecrow editor Lee Rourke. First three contributions are by Pete Wild, Steve Finbow and Stuart Evers. A little piece by me will also be along in a few days, all being well. 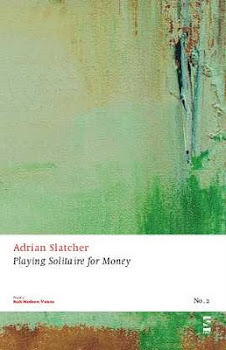 Now its October, the forthcoming launch of "Mostly Truthful", the new online Flax publication at Lancaster Literature festival gets ever closer, and it will be great to return to the Storey Institute, this time as a reader, rather than in the audience. Tickets are free. Tomorrow night is Booker Prize night, and "Wolf Hall" by Hilary Mantel seems a "shoe in" but of course, the Booker doesn't do shoe-ins. It wouldn't surprise me if one of the lesser known writers on the list, Adam Foulds or Simon Mawer, came in as a surprise winner. Unlike "Sea the Stars", the remarkable horse that has just added the Arc to its Derby and 2000 Guineas, the thoroughbreds of the Booker don't always come first. There's an alien invasion in Manchester this week, as the Conservative party conference comes to town. Alien, in a very real sense, as whilst when Labour comes to town there will be lots of meeting with old friends, and obvious allies, there's hardly any Conservative presence in the city - with not a single Conservative councillor in Manchester itself. But this is a precursor, in many ways, for what will happen if the Conservative Party win the next election. They will be, to all intents and purposes, the party of the south, with some northern outposts. Manchester, being very welcoming, might even welcome these particular aliens, but not if they bring with them their bad habits - you know the kind of thing, slashing taxes for the rich, foxhunting, closing SureStart centres, hanging out with jackbooted far right groups in Europe. A few little local customs are one thing, but these aliens need to do a lot more to assimilate if they want to be taken seriously across the whole country. The legacy of Thatcher, of course, is that they didn't ever see this as important - its why they hardly exist in Scotland these days, for instance. Whereas the Scots might grumble about a Labour government in England, at least its a grumble that is more of a family feud. A Conservative government in England could potentially have next to no representation in Scotland - which would surely precipitate the breakup of the UK. Hardly what David Cameron wants on his plate in his first days in power. I'd like to know where Cameron, and more correctly, the party that stands behind him, stand on a number of issues. Sometimes Cameron, with his Smiths albums, easy charm, and liberal tendencies, appears the nicer side of Conservatism, but you wonder about the antediluvian hordes coming up his rear. They will, I'm sure, have initiatives aplenty, but initiatives are what breeds the kind of quango that the Conservatives have loathed (and perhaps rightly so) about "new Labour." I can't imagine a new localism coming from the centre, not when Northern cities such as Manchester remain Labour, even if the love for the party nationally is highly strained. The arts, I fear, will suffer immeasurably, under a Conservative administration - its one of those "softer" areas of public spending that Labour, to its infinite credit, has seen "in the round", offering economic and social as well as more direct benefits. If we're a society that can afford £2,000 to new car owners, to scrap their old, then I'm sure we can afford the "experience" culture that is crucial in the arts. I was at the TedX Manchester Conference yesterday, and it was a mixed bag of speakers, but with the wonderfully diverse people ecology of urban Manchester out in force. The repeated message of the day seemed to be about disruption to business models, a deliberate provocation given we were in the BBC on Oxford Road. The week before I heard Andrew Keen speak in Liverpool, and its interesting to get his contrarian views on social media, the internet, and, yes, blogging. Somebody somewhere needs people to be paid for what they do. After all, the freelancers and others at these conferences don't get their networking drinks paid all evening, or the taxi home. One imagines a journalist is often tempted, when asked to provide their expertise for free, to say, "yes, but can I have this round on the house as well?" I don't see this as a natural constituency even amongst the libertarian wing of the Conservative party - despite there being more right-wing than left-wing political bloggers. I guess blogging is partially a culture of opposition, as it is. There is, I believe, always a morality to art, or should be. For the artist - and the curator, the editor, the critic, those other interlocutors - is a maker of choices as well as the work itself. We still refer to certain art as "naive" or "primitive" or "outsider" usually because we see it as coming without the interlocution or that it doesn't come with an intellectual (and for that read: moral) framework. Even where anarchy rules its the controls on that anarchy which are so important. Composers such as Cornelius Cardew or John Cage created set pieces in which a playful lack of control could take place. A Kenneth Anger film plays with the social mores of the day; and a Charles Manson or Adolf Hitler's own art tells us next to nothing about their diabolical nature. The thousand monkeys typing away forever to create "Hamlet", have to, first of all, be taught how to use a typewriter. The artist's personal morality is as nothing to the morality of the work. You can have a very poor opinion of Polanski's life choices, and still find Chinatown remarkable. "Billie Jean" can be enjoyed without questioning the motives of its writer. That we might think less of the work, the more we know about the life is a judgement that all art faces. Yet in an irreligious age, religious paintings and great cathedrals can sometimes seem the only thing remaining of our Christian mythos, the Christian art of today - whether Christian rock bands or "moral" films - offering us only a reflection of the decentralised place that the belief now has in society. I am primarily a libertarian, as I believe censorship is always problematic, and on these grounds alone, I would be appalled at the Met visiting the Tate (now there would be a title for a reality TV show) to remove Richard Prince's "Spiritual America" on the say-so of the Daily Mail. There is always something so wrong, and so predictable about this particular catalogue of events that you almost feel that the Daily Mail must have a staff position, Our Special Correspondent in Dirty Art, or something similar. We are told in the Guardian that "the catalogue for the exhibition withdrawn from sale. The work had been accompanied by a warning, and the Tate had sought legal advice before displaying it." On the one hand, in British law, something can only be deemed obscene by the courts, not by PC Plod, but on the other, there is an exception to this - in that possession of indecent photographs of children is in itself an offence. The logic of this, legal advice notwithstanding, is that the police should track down the said child in the picture, one "Brooke Shields", put a warrant out for the photographer (as well as the "possessor", which may or may not be the artist, the Tate Modern) and probably then destroy all copies of the picture. We are told that in fact, this is what Brooke Shields herself has tried to do on several occasions. Adrian Searle, also in the Guardian, adds "it is clear Prince took responsibility when he borrowed Gary Gross's photo, and knew exactly what he was doing." This is, I suppose the morality of the art that I am talking about. It is not an "absolute morality", but a relative one. Probably in the Tate, but certainly in the National Gallery, there are many, many pictures of naked children, whether realistic or "cherubs." The sexualisation of those images may not be as recent a thing as we sometimes think, yet it would be hard to think of them as being the target of the Met. In this particular case, as in other gallery showings of photographs of children in the past, is it the medium or the image itself, or the exhibition of the piece that is most unsettling? Or, in terms of the relative morality of art, is it the intention of the artist, that if it means anything at all, can and should be questioned rather than given "cart blanche" approval. A libertarian cannot choose whether or not a particular image should be censored or not; but an artist - and those interlocutors - can decide. In an age when we have moved quickly from the indidividual iconography of a single artwork, to the mechanical reproduction of print, film and recording, to the multiple simulataneous imagery of the internet, it seems, more than ever, than the morality of the art is not a "given", but shifting, and that the artist, in order to call themselves that, has a responsibility that is not easily shirked by saying (and I'm not saying Prince is saying this), "here it is, make of it what you will." Artists are the first and best censors of their own work. In this particular case, I'm minded that a ten year old girl was a "minor" when decisions were taken on her behalf, and that even if the genie can't be put back into the bottle (the internet being what it is), she should be able to have a say in rectifying that particular abuse (and it was an abuse.) It is in that context, not the context of the image itself and its exhibition, that we should question the morality of this particular artist and this particular show. That America had no apparent problem with it (yet was scandalised by Ofili's dung paintings) doesn't make them superior or inferior to us (whether its the "Daily Mail" reader or the Tate Curators), but reminds us instead that there aren't any absolutes in artistic morality.